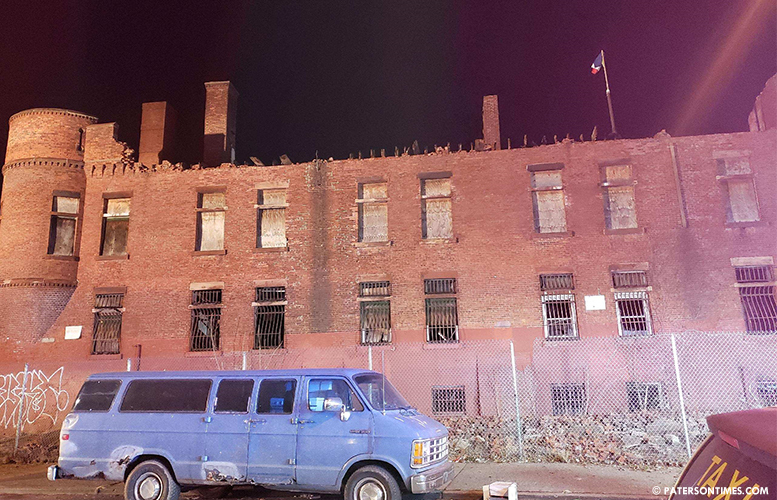 The parapet wall of the Paterson Armory on the Market Street side collapsed on Monday evening. Municipal officials said a 20 feet long piece of the Paterson Armory came down at about 6:39 p.m.
“I heard a big explosion. It shook the office,” said Edgar Collazo, owner of Five Star Transportation on Market Street. His office is across the street from the Paterson Armory, he said. Collazo said several dozen people came out of their homes and businesses to see what caused the loud sound. No one was injured in the collapse, said deputy fire chief Pablo Del Valle. He said the affected area was cordoned off for safety. Municipal officials have to determine whether the collapse warrants demolition of the fire-damaged structure. Economic development director Michael Powell said his building department has yet to make a determination whether the collapse requires demolition of the building. Construction official Gennaro “Jerry” Lobozzo has to make the call, said officials. The city sold the building to prominent developer Charles Florio for $3 million in the summer. Florio said the building may have to be knocked down. Florio unveiled an ambitious plan to build 138 luxury apartments and 10,000 square feet of retail space at the site for $20 million. He envisaged preserving the remaining portion of the 19th century building. A massive fire destroyed much of the Paterson Armory in 2015. There have been grand plans for the site over the years, but none of them came to fruition.